Bio•Plete™ is a truly unique pharmaceutical grade formulation which has been specifically designed to address the biochemical abnormalities most commonly observed in people seeking pain treatment. BioPlete has been designed to address the chronic inflammation, increased oxidative stress, abnormal neurotransmitter status, and micronutrient deficiencies commonly seen in chronic pain patients. These biochemical abnormalities are extremely prevalent and directly linked to the development and/or worsening of chronic pain. BioSci Therapeutics™ is a life science division of Ethos Research & Development dedicated to the development of novel, non-opioid adjunct therapies for the management of chronic pain. Recent reviews indicate that total societal costs of chronic pain in the United States range from $560 to $635 billion annually. The cost of chronic pain due to direct medical treatments and lost productivity represents a greater economic burden than many of the nation’s priority health conditions such as heart disease, cancer and diabetes. Despite the soaring costs of treating chronic pain, complete relief is uncommon due to the limited efficacy of current treatments. 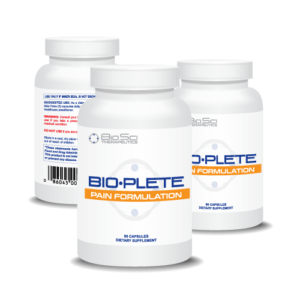 BioPlete is manufactured in a GMP certified facility in the United States. GMP compliant manufacturing processes ensure optimal characteristics of the product, including identity, conformity, purity, strength, and composition. Comprehensive laboratory testing ensures that all products are free of heavy metal and bacterial contaminants.